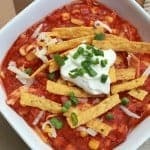 I love this creamy Slow Cooker Chicken Taco Soup recipe! Since our days have turned colder, it's so comforting and with such a great taste! Place chicken, tomatoes, onion, green chiles, black beans, garlic, paste and corn into a slow cooker.